REARDEN STUDIOS highly-qualified staff brings to your project a balance of both creative and technical talent. 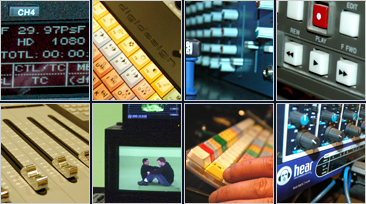 Our state-of-the-art HDTV and audio editing studio can handle any format, from DVCAM and DIGIBETA, to HDCAM. Whether your medium is the web, broadcast television, the silver screen or even a new HD DVD, Rearden will make your visuals shine. Our post-production services range from concept and design to editorial and online finishing. We offer complete HD/SD post capabilities, graphics and DVD development. We also provide an integrated audio suite equipped with ProTools HD recording/editing. Conveniently located in San Francisco's South Park neighborhood, we foster a friendly, creative environment. Our single objective is to help you achieve your artistic vision.